John Moten looks for a hole in the Michigan defense. The junior running back led Northwestern with just 36 rushing yards. For the first time since 2013, Northwestern does not have a reliable, established lead running back to rely upon offensively. Monday’s news that sophomore Jeremy Larkin would have to medically retire from football all but etched that in stone. But Saturday’s performance against No. 14 Michigan, a respectable 20-17 loss on the scoreboard but utterly woeful from an offensive perspective, fully chiseled the fact into granite. The Wildcats’ (1-3, 1-1 Big Ten) rushing attack was completely shut down by an aggressive and amorphous Wolverines’ (4-1, 2-0) front seven. Including sacks, NU finished with just 28 rushing yards; even removing sacks, the team tallied 28 carries for 71 yards — a sluggish average of just 2.5 per attempt. Michigan entered the afternoon touting one of the best run defenses in the country, having held opponents to just 2.7 yards per attempt in its first four games. And then the Cats did even worse than that. Not only did defensive end Chase Winovich and the pass rush terrorize senior quarterback Clayton Thorson on his dropbacks, sacking him six times, but they also completely bottled up any runner NU plopped in next to Thorson. Junior John Moten finished as the lead rusher with 13 carries for 36 yards and a touchdown. He was involved in the passing game on the team’s first drive, taking a slip screen for nine yards, but recorded no further receptions. Moten avoided any big losses or catastrophic mistakes, but also made few plays of note. Freshman Isaiah Bowser — anticipated as the new change-of-pace back — was barely seen, getting only one carry (for two yards). Instead, it was oft-injured senior speedster Solomon Vault, unexpectedly making his first appearance since 2016, who took over that role. Vault, primarily a returner in his college career prior to undergoing surgery a year and a half ago, was cleared to play and incorporated into the offensive plan Monday, Moten said. The Maryland native took his second touch for nine yards and looked ready to explode, but never again found any space. He finished with seven rushes for a paltry 18 yards. Fitzgerald and offensive coordinator Mick McCall came out with a game plan that included some new looks, including junior receiver Riley Lees — a converted high school quarterback — taking some direct snaps in the wildcat formation (he finished with two carries for eight yards). 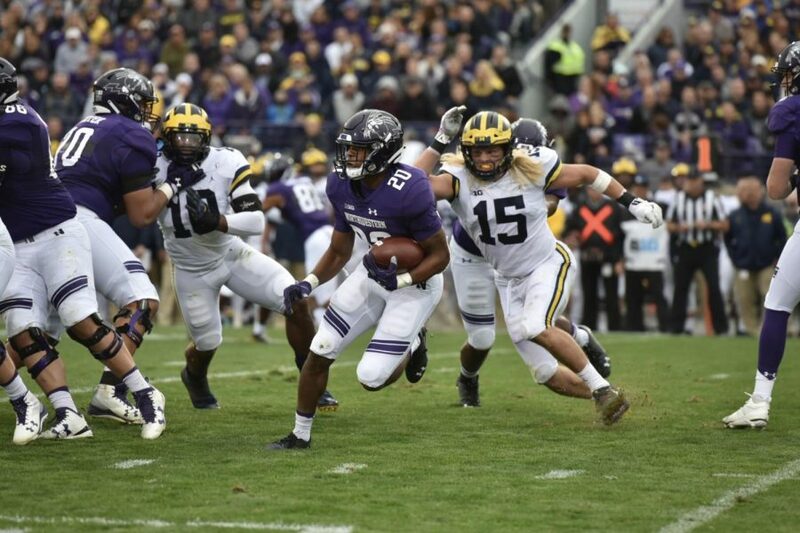 That game plan worked at first, spotting NU 17 points in the game’s first 20 minutes, but an unsightly combination of offensive line injuries, Michigan defensive adjustments and inexperience at the running back position doomed the offense beyond that point. Still, Fitzgerald remained optimistic about the position group’s outlook after the game.